The posts are 90mm square pine and are supplied with bolts for assembly on to the head and foot sections. A decorative metal plate is supplied as standard. The bed can be assembled without this if preferred. Bed side rails: 20mm solid pine with 2 bolt assembly to connect the side rails to the headboard posts. 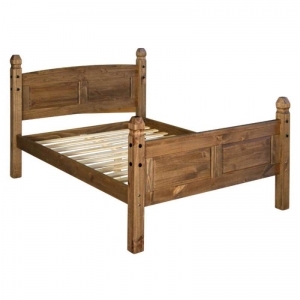 Bed slats: solid pine individually screwed to side rails. Bed assembly: bolts with half-moon nuts, large screw bolts, dome head crews, dowels and wood glue. External finish Initial sanding to a medium grade finish which leaves sanding lines as part of the overall finish. Followed by a base coat of sanding sealer and a combined top coat of spirit based stain and finish.